Most business owners say they never have time to do everything they need to do. Instead of trying to use more productivity hacks or work longer hours, you need a data-based method which uses Business Finance to Set Priorities that Increase Profits. Work smarter, not harder. Do more with less. Do what’s important instead of what’s urgent. All of these idioms are saying you should prioritize and focus. But, none of them are telling you WHAT to prioritize and focus on, or HOW to decide what to prioritize and focus on. We’re going to let the numbers do the talking today. The comparability of the input scenarios will propagate through the model to make the output response scenarios comparable as well. So here’s what we’re going to do. First, we need a financial forecast for the next 12 or 36 months. Then we’re going to do some sensitivity analysis on the input assumptions of that forecast. But we’re not just going to do any ole’ random sensitivity analysis. We’re going to vary the input assumptions in a comparable way so that the responses to those inputs are comparable. This concept is illustrated with pictures in Figure 1 for visualization. For example: if we want to know what matters more between lowering COGS and reducing inventory costs, we vary both by ±10% and see which one has a larger impact on profits for the forecast period. There are several other ways to determine what comparable inputs are, but we’ll talk about those later. Figure 1. 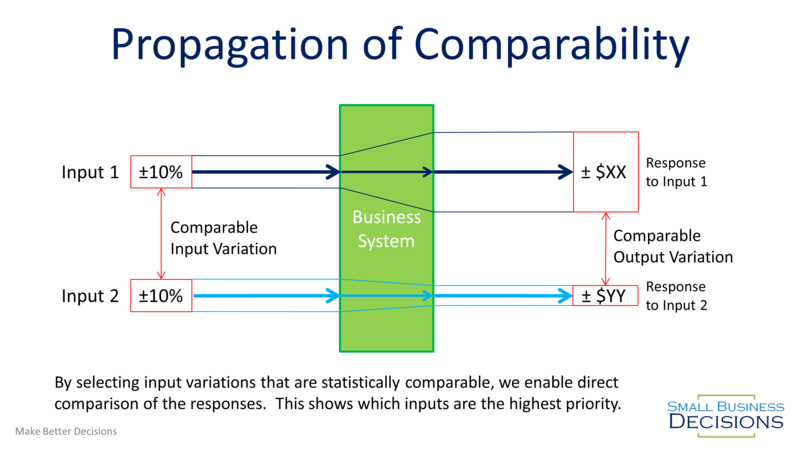 Graphical illustration of the Propagation of Comparability. Inputs that are comparable mean that the responses to those inputs are also comparable based on the relationship of the inputs. The end result of this can be visualized with my favorite tools: a Pareto Chart or a Tornado Chart. The value charted is the range of response vs the name of the input. How is this different than a Tornado chart from Monte-Carlo analysis? – it is quite similar actually, but the difference is that in Monte Carlo you aren’t always varying your inputs in a comparable way. It is possible with Monte-Carlo to choose input distributions that are comparable, but most of the time the focus is on the most likely input and its impact to the probability of outcome, instead of the comparability of inputs. If we use Figure 1 as an example, without this focus a planner may have chosen a wider range for Input 2 and a smaller range for Input 1. This would make the responses potentially tell a different story. This method does not require any Monte-Carlo add-ins for excel or enterprise planning systems. With this concept, you can start to see how every single input has a direct impact on profits. Some accounts that might be the most important in one business, will not even move the needle in another business. Some accounts that seem to plague your business might not even matter to your fellow business owner at the chamber of commerce. Which will change whether or not you take their advice on what to focus on. Doing this type of comprehensive and structured business finance evaluation will give you your true priorities. Now that we know which items in your business finances have the largest impact on profits, it’s time to choose Key Performance Indicators (KPIs) that will watch those highest priority areas of your business. I have recommended KPIs before, but only based on which ones will give the broadest coverage of a business and catch big common issues. Your business is unique, so the best KPIs aren’t what’s popular. The best KPIs are based on what makes the biggest impact to your bottom line. To do this, your financial forecast needs to be capable of handling variations in any of the inputs that you want to test. In some cases, this type of testing may identify weaknesses in existing models. The forecast should be a full financial forecast with P&L, Balance Sheet, and Cash Flow statements. Don’t Have a Good Forecast? While not the preferred method, you can do the exact same thing, but replace the forecast with your last 12 months of financial data. Instead of asking what might happen next year, you can learn with a “What-if” scenario from last year’s data. Chances are if last year’s data shows that you would have taken home %30 more cash from a 10% change in inventory capital, then that will still give you a good idea of what priority inventory is vs another change going forward. You will need to make sure your P&L or Balance Sheet is re-calculating your balances with each test change. What Inputs Should I Compare? You should compare all of the major inputs to the Cash Flow KPIs listed in The 3 Most Important Financial KPIs for Cash Flow and all of the major account categories in your P&L and Balance Sheet. I won’t get too prescriptive here because you know your business finance situation better than I do. If you think it might be important, do it. Doing a three-point test on 20 different accounts will take some doing, but will be incredibly powerful in terms of setting priorities that will increase profits. There are many different ways to compare the inputs to a system. The key is to state what the comparable feature was in your results. Here are a few input comparison methods. The simplest method is to vary each input up and down by 10%. That means we have an absolute comparison that says: “If these inputs change by ±10%, then the highest impacts to Cash Flow are in this order.” or similar. Each of the inputs to your financial model will have a historical variance or standard deviation. That would be a great way to compare the significance of inputs to each other. We know that ±2 * Standard Deviation covers 95% of the scenarios that each input has been in. So we can state the prioritized outcome of that test as: “Given the last 12 months performance and performance variation, the largest influencers of our financial performance going forward are in this order.” or similar. This is probably one of the most useful scenario tests if you’re looking for where to invest process improvement money. If you have 1 FTE for process improvement, you would estimate how much that resource could influence each input. Then your input variability is the “as is” scenario vs the “could be” scenario. We can state the prioritized outcome of this test as: “For a given amount of effort, the highest profit improvements are in this order.” or similar.